Once you get inked, you’re in it for life. Behind the scenes, however, to have a tattoo last forever, the cells that carry the pigment die and pass on their ink, in a continuous cycle. New findings could lead to better tattoo removal techniques that leave the skin more natural looking. Until not too long ago, scientists used to think that tattoos lingered on the skin by staining fibroblast cells, which are the most common cells of connective tissue in the dermal layers of animals. However, we now know that it’s not only skin cells that get inked but also macrophages — specialized immune cells that are called to the wound site and then engulf the tattoo pigment like they would normally do with any invading foreign organism or dying cell. Most of the fibroblasts, and macrophages alike, become suspended in the dermis where they’re locked permanently. The dye in both cells shows through the dermis which is how you can see your tattoo. Sandrine Henri and Bernard Malissen, both researchers at the Centre d’Immunologie de Marseille-Luminy, have found that the full picture is even more complex. It was always assumed that the macrophages carrying pigments live forever, which is what allows the tattoo to be permanent. What the French researchers found, however, was that the macrophages do die eventually, only to pass on their pigment to other cells that keep carrying the torch. “We were quite surprised to see that only very limited infos were available on the skin cells that are responsible for tattoo persistence and that account for their strenuous removal. Therefore the knowledge we recently gained on the immunobiology of skin macrophages, their dynamics and the possibility to ablate them ‘à la carte’ explain why we are getting a greater understanding of their permanence,” Malissen said. In one experiment, the researchers genetically engineered a mouse in which they were able to kill the macrophages circulating in the dermis and other tissues. Over weeks, new macrophages derived from monocytes (precursor cells) moved into the area. 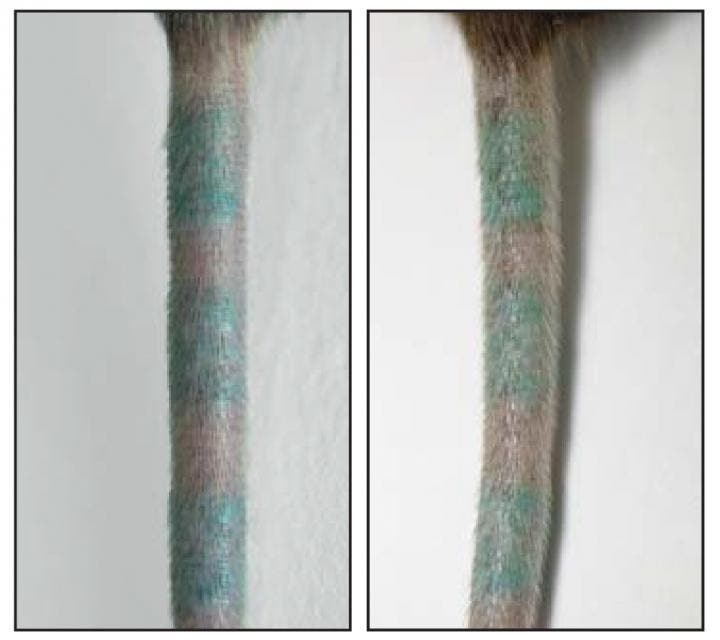 Only the dermal macrophages could gobble up the pigment, the researcher found in a trial when they tattooed the tail of the mouse. Because tattoo pigment can be recaptured by new macrophages, a tattoo appears the same before (left) and after (right) dermal macrophages are killed. Credit: Baranska et al., 2018. The tattoo’s appearance did not change when the macrophages were destroyed en masse. Upon closer investigation, the scientists found that the dead macrophages release their pigment into the surroundings, which is eventually absorbed by the monocyte-derived macrophages before the pigment has a chance to disperse. This pigment capture, release, and recapture cycle occurs over and over again in tattooed skin, whether or not macrophages are killed off in one single burst. When researchers transferred a piece of tattooed skin from one mouse to another, the pigment-carrying macrophages were sourced from the recipient, rather than the donor animal, over several weeks. Green tattoo pigment is absorbed by macrophages (left). Pigments is released when macrophages die (center). About 90 days later, the pigment is gobbled up by new macrophages (right). Credit: Baranska et al., 2018. The findings could one day lead to tattoo removal procedures that are more efficient and less painful. When a tattoo is no longer desired, people typically turn to laser removal. 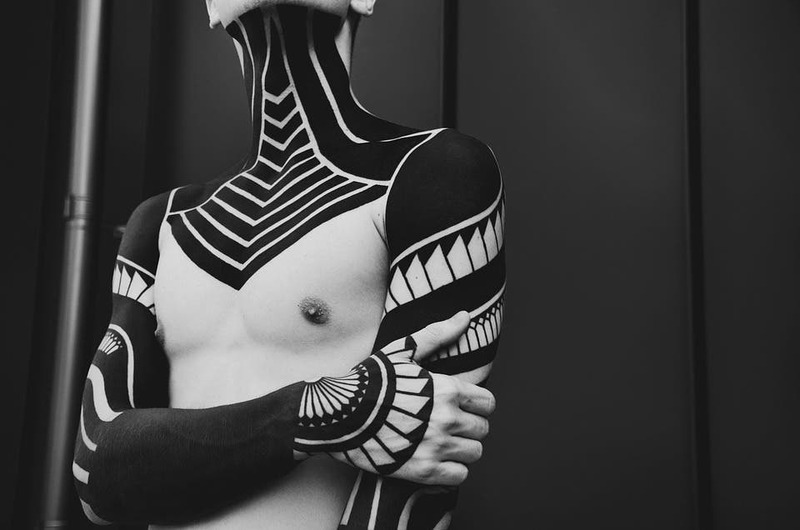 Laser pulses fragment the tattoo pigments, flushing them into the body’s lymphatic system. The procedure isn’t perfect, though, as several cycles of treatment are required and some parts of tattoos remain immune to the procedure. We now know this happens because a fraction of the fragmented pigments remain on site and get recaptured by neighboring macrophages. Malissen says that, unfortunately, the study’s findings won’t do anything to stop tattoo fading, which is “likely due to the fact that during the successive capture-release-capture cycles, minute amounts of released pigments are drained away from the skin.” Beyond tattoos, the study aids people with hyperpigmentation conditions in which patches of skin become darker in color than the normal surrounding skin. Findings appeared in the Journal of Experimental Medicine.